← Yordie Sands InWorldz, Yay! 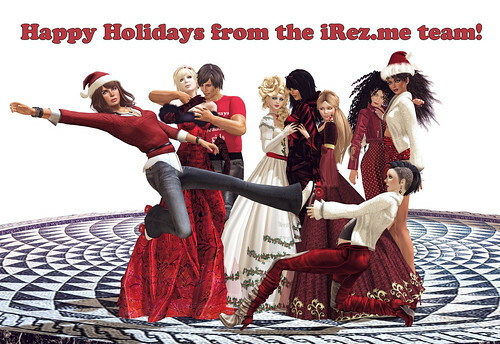 I haven’t been around in Second Life much this year but was lucky enough to join the iRez Salon authors for a happy holiday photo. Strawberry Singh shot the photo, that’s her in the roller skates with Vaneeesa Blaylock (iRez publisher) in front. Kikas Babenco, Marmaduke Arado, Ravanel, Lizzie Gudkov, Trilby Minotaur, Wilma Mankiller and Yordie in back. Holiday hugs and love! This entry was posted in Journal and tagged Blogging, Holidays, Photography, Second Life. Bookmark the permalink. 1 Response to Happy Holidays to Everyone!